De Anza Appliance takes pride in their knowledge, reliability, and integrity. We rarely have employee turnover, your appliance repair technician has often been with us or in the industry for over 10 years. Those newer to the trade apprentice for 6 months before running appliance repair calls solo. Meet the staff and technicians that strive to fix your appliance in one visit whenever possible. Meet our Front Office and Service Technicians. 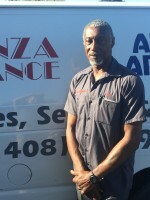 Roger has been with De Anza Appliance since 1974. 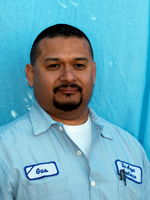 Through the years he has been an appliance installer, technician, service manager, and helped manage the retail and parts operations our old De Anza Boulevard location. Roger works with a peer group of appliance servicers across North America to share best practices. Outside of work Roger has volunteered with local Scouting organizations for over 20 years. He cooks each Wednesday night for the South Hills Community Church Men’s Ministry, and is an avid league bowler. Roger comes from a long line of Eagle Scouts including his two sons, brother, and grandfather. Cindy came on board to De Anza Appliance from a human resources and an accounting background and worked with Eaton, Recortec, and Viking Freight. She started on a part-time in 1985 when Roger was short-handed, in the office. 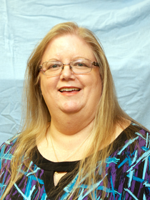 Over the years her position evolved into a full-time office manager handling bookkeeping, payroll, benefits and accounts receivable. Roger and Cindy earned the Polaris Star Award for their volunteer work with the Boy Scouts. In her free time she enjoys traveling (Hawaii is her favorite spot), movies, and antique shopping. 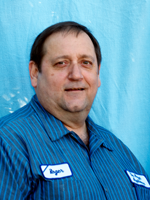 David started with De Anza Appliance in 1987 working the parts counter and handling dispatch. In the 1990s and until 2004 David managed the appliance showroom and oversaw the retail parts and appliance sales divisions of the business. Today, David manages the day-to-day operations of the business. He currently holds leadership positions with the Cupertino Chapter of Business Network International (BNI) to further professional networking across different businesses in the Santa Clara County. David earned his Bachelors in Business Administration emphasizing in Management with honors from San Jose State University. 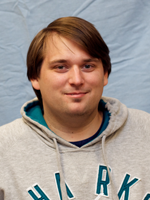 He is a fantasy sports enthusiast and manages several fantasy baseball and football teams. David is also an avid golfer, poker player, and movie enthusiast. He has bungee jumped, skydived, and survived! Chris began working as a file clerk and office assistant in 1994, taking over the dispatch desk in the summers while in high school. He quickly learned appliance sales and the parts desk while serving as a second man on deliveries. After moving to Chico in 2002 for school Chris spent seven years working as a customer service representative, account manager, sales trainer, and recruiter with Build.com. 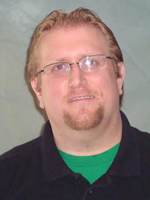 Chris returned in 2011 and took over business development, marketing, recruiting, and management of the dispatch staff. He earned his Eagle in 2000 and is an active outdoor enthusiast, table-top gamer, and hockey fan. 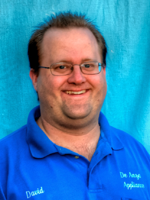 Chris works as a personal recruiting consultant and a comic book reviewer and clerk on the side. Krystal comes from us from a strong customer service background from several, local plumbing companies. Today her recommendation for plumbing services is our new referral partner EJ Plumbing based out of Santa Clara. Krystal feels at home in our casual, family-friendly atmosphere. In her free time she hangs out with the kids, looks forward to beach days, and catches the newest horror flicks on Netflix. Fun fact about Krystal she is an avid tattoo collector. Nick began working with De Anza Appliance helping with customer mail outs. Now he works part-time helping the parts team and auditing technician’s invoices between teaching contracts and theater gigs. Nick studied at the Foothill College Conservatory Theater and under San Jose States Theater Education department as one of the last students in both programs. He’s an Eagle Scout. In his free time he likes to play video games, hike, swim and read. 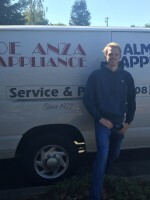 Jacob started working with De Anza Appliance in 2015 as an administrative assistant, part-time while going to college. Currently at Foothill College, he dabbled in theater an currently pursuing a degree in Business Administration with an emphasis in Human Resources Management. In the next year or so he’s looking forward to transferring to San Jose State. On the weekends Jacob works with a children’s entertainment company, making appearances as Batman, a pirate, a clown and other characters. Jacob spent some time honing his customer service experience working front-end staff at several restaurants and with 24 Hour Fitness as a Service Representative. In his free time he enjoys tabletop and video games, reading this week’s newest comic books, hiking in foothills, catching a movie, and Pop-Culture Conventions and local fairs and festivals. Little known fact, Jacob survived a tussle with a rattlesnake as a teenager. 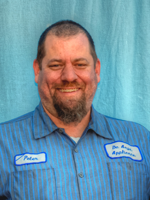 Peter began his career with De Anza Appliance in 1999 as an appliance installer and became a technician in 2004 with Almaden Appliance acquisition. Before De Anza Appliance, Peter worked in sales, customer service, retail, and computer support showing an early aptitude for great customer service. Peter currently helps train our team in boutique, high-end, import, and niche appliances and helps the onboarding process of technician apprentices In his free time Peter stays current with science news, plays chess and studies comparative theology. 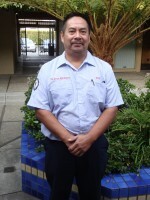 He has twice biked across the entire U.S.
Rey joined the De Anza Appliance team in 2013 and learned the trade working with Sears Factory Service and earned certification in HVAC repair. In his free time he enjoys spending time with his family. Ken joined the De Anza Appliance team in 2015. At an early age showed a technical aptitude to his parent’s chagrin tearing down light switches and sockets. After a career in the United States Marine Corps he returned to civilian life as an IT professional. Picking up more skills and a second income he’s self-taught HVAC and appliance repair through Thomson Education’s online program. A career change brought him to GE’s Factory Service for several years and he’s our resident expert on General Electric appliance repair. Ken loves appliance repair because he learns something new daily and every problem is like a puzzle. In his free time he enjoys watching action movies, spending time with the kids, and keeping up with the 49ers. He loves De Anza Appliance, compared to most other tech firms and appliance repair companies it’s stress-free, family environment helps him succeed helping customers.